Our departmental library (which bears the name of Berthold Lewis Ullman Collection) had modest beginnings; enjoyed steady, even rapid growth; its future is secure, but limitations of space appear to preclude any substantial further expansion. As Prof. George Kennedy describes, when he arrived in Chapel Hill in August 1966, “the Departmental Library occupied a narrow room on the first floor of Murphey Hall.” At that time, the Library already contained a set of Pauly-Wissowa, some parts of Mueller’s Handbuch, a collection of texts and monographs, and a run of L’Année Philogique; perhaps a total of 1000 volumes. The collection of Loeb Library Greek and Latin texts was stored in a locked cabinet in the seminar room. For access, one had to get the key from the department secretary. The primary reason for ‘the lock’ was the desire to prevent students (undergraduates in particular) from using the Loebs as translation aids. 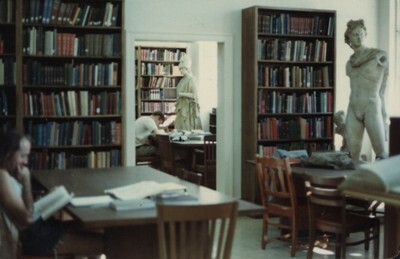 The library was later moved across the hall to a larger room; subsequently to a still larger room at the southwest corner of the first floor of Murphey. In 1966 the Classics department was confined to some offices on the first floor of Murphey and a few on the second floor. Subsequently, we were gradually able to take over the space on the second and third floors previously occupied by various other entities. It then became possible to move the library to larger space on the third floor. 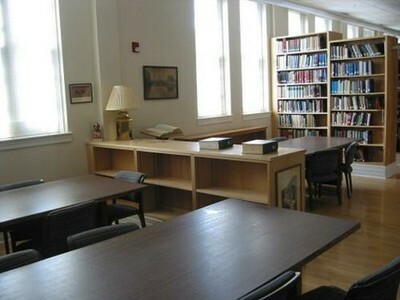 The library still occupies this space, however somewhat reduced after the remodeling of Murphey Hall in 2002. This reconstruction also forced us to move our extensive collection of offprints (often from rare publications, an accumulated treasure from collections of various scholars), previously conveniently stored in filing cabinets, to shelves in the computer room. The library began to flourish. Prof. Kennedy himself did “all sorts of things, including ordering, cataloguing, shelving, and repairing books.” Most of these books came from the collections of earlier professors: Bain, Harper, Epps, and Harland, and especially from the purchase of the library of Professor B. L. Ullman (made possible by Gertrude Weil of Goldsboro). For many years the department had housed the American office of L’Année Philologique, and later also the editorial office of American Journal of History (both institutions have since migrated to other universities). This connection was an important source of books (also for the University’s Wilson and Davis libraries); in particular we regularly received and kept issues of several journals. Some items have been purchased from the departmental funds, especially the Ullman Fund. When in 1994 I took over the responsibility as the “Keeper of the Library,” I was only vaguely aware of the immense task and challenge that lay ahead. Under the incomparable administrative skills of George Kennedy the library had grown very substantially in size, and had become a convenient learning and research resource both for the students, undergraduate and graduate, and the faculty. In the last decade of the last century our holdings again increased dramatically thanks to the bequests of the libraries that had once belonged to three eminent scholars, Friedrich Solmsen, Berthe Marti, and T. R. S. Broughton. More recently the library has been enriched by the books from the collections of Gerhard Koeppel, Philip Stadter, and Kenneth Reckford; and also from the collections of Ann Zenner and Thomas J. Reilly. All this had created an enormous cataloging problem which we could not hope to solve if we had continued with our own home-grown dear and logical but unique and difficult system. With a heavy heart I took the decision to convert our catalog to the Library of Congress classification system. It is a tool imperfect but efficient. A further goal was the computerization of the catalog. This laborious task could not be accomplished solely with the help of graduate students working as part-time library assistants. Thanks to the understanding and cooperation of the successive heads of the department, funds were provided for the employment of full-time librarians. We have been fortunate to enjoy the services of several dedicated librarians, especially (now Dr.) Kathryn Fiscelli (MA and PhD, UNC-Chapel Hill), Jeni Hoffman (M.A. UNC-Chapel Hill), and Robin Chen (BSIS UNC-Chapel Hill). Thanks to their efforts the Library is now neatly organized, and easy to use. Currently the library contains 10,000 volumes of books as well as numbers of volumes of periodicals. It offers a pleasant place for adventures of learning and research, and is poised to serve and nourish the ever progressing generations of students and scholars. The remodeled Ullman Library in 2008.